Our safari guide will pick you from your hotel and depart by road driving through the rich Kikuyu farmlands to the edge of the Rift Valley. Descend the escarpment and drive via Narok to Masai Mara Game Reserve with picnic lunch served en-route. The Masai Mara is classic African savannah, and the sheer density of wildlife is amazing. Masai Mara is famous for its Black manned Lion and yearly migrations of Wildebeest and Zebra, Elephant, Buffalo, Rhino, Gazelle, Leopards, Giraffe are also found here. Afternoon game drive. Dinner and overnight at a safari camp or lodge. After breakfast, you will go for a full day spent viewing and exploring this spectacular National Park. Wherever you go in the Mara, you will see an astonishing amount of wildlife. Of the big cats, lions are found in large prides everywhere. Cheetahs and leopards are harder to spot but are still fairly common. Return to your safari camps or lodge in the evening for dinner and overnight. 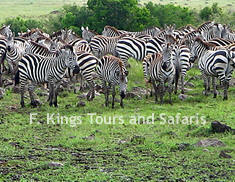 After breakfast, depart Masai Mara for Lake Nakuru with Picnic lunch en-route. On arrival c heck in at Lake Nakuru Lodge and have lunch. Short nap will be followed by an afternoon game drive. Lake Nakuru/Lion hill lodge is famous for its pink Flamingos and many other types of birds. 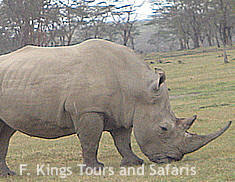 There are rare species of animals the white rhino and Rothchild giraffe among a wide variety of game. Dinner and overnight at Lake Nakuru Lodge/Lion Hill lodge. After breakfast spend the morning watching and photographing the birds and wild animals in Lake Nakuru national park. Depart the Lodge after lunch and leave for Nairobi stopping for panoramic views of the Great Rift Valley en-route. Arrive in Nairobi in the afternoon.